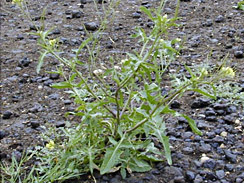 Rocket is in the mustard family and can generally be found growing alongside field mustard. 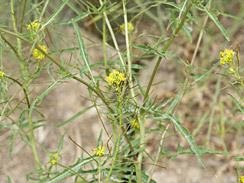 This plant is much less densely leafed than field mustard, with fewer flowers. Each of the older flowers is loosely cupped by a ring of long slender spikey-looking seeds pods. It’s common for younger plants to have only one flower. The upper leaves tend to be quite small and cling to the stem. 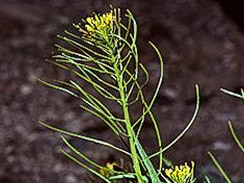 The lower leaves are larger, flaring outward, and deeply serrated. Due to the smallness and relative delicateness of its leaves, rocket is less suited than field mustard as a substitute for commercial mustard greens. Its lower leaves, however, make very nice fresh salad greens. They’re hairless, smooth and soft, with a milder taste than field or black mustard.